My name is Sokho Eath. I was born in Portland, Oregon and in a pretty typical Cambodian household that included not only my parents and my siblings, but also extended relatives like my grandparents and my aunts. In the second grade I moved three hours away to Newport, a rural town on the Oregon Coast, where my father got a job in construction. Despite the distance, we still went back and forth to Portland almost every weekend because that is where the rest of my family and the Cambodian community were. My family came to the United States in two waves. My paternal grandfather came first with Lon Nol, the President of the Republic at the time following the fall of the Khmer Republic in 1975. Eventually he left California and resettled in Portland. While my grandfather was able to come before the Killing Fields, those in the second wave, which included both my mother’s and my father’s families, had to flee the Killing Fields to refugee camps in Thailand. My father’s family ultimately reunited with my grandfather, but as in most Cambodian families, many of my father’s siblings died; only my father and one of his youngest sister survived. On my mother’s side, her entire family was resettled in Portland, possibly through a church organization. Both families arrived around 1980 or 1981, and I remember hearing a story about how my paternal grandmother recalls seeing Mount St. Helens and the ash on the ground after the eruption. What was it like for you growing up Cambodian American in Oregon? In what ways do your parents or your culture shape your identity? I think for most Asian American families, proximity to community is very important. The difficulty for me was that unlike most other Cambodian Americans I knew, I was raised in a small town with very few people who looked like me, which made me feel very separate and isolated. But as I was growing up, my family really helped me develop a strong sense of what it meant to be Cambodian American. They were open in discussing their refugee experiences with me, and I remember it would bounce between lectures about surviving war, famine, and the Killing Fields, and deep conversations that instilled the pride that comes from being a part of this history and this community. Being around my paternal grandparents exposed me to a lot of different parts of Cambodian culture. For example, the Buddhist faith is a big part of my family and I remember going to the temple with my grandmother and being curious about everything — meditation, monkhood, the sermons. I also have memories of my grandfather taking me to school every morning when I was in preschool and kindergarten, and I remember him making me bow to the teacher and saying, “Hello, Teacher” before class; the same thing would happen when he picked me up after school. He explained to me that this is what you do as a Cambodian kid. I didn’t really know English at the time since I grew up in a Khmer-speaking household and I hadn’t really been exposed to American customs, so I didn’t question this practice — I just thought it was something everyone did. Also, my grandfather, especially since he had been part of the government, was always involved in politics and so since I was young, I was also immersed in that world. I would watch him go into meetings with community members or talk (mostly “yell” in “passionate discourse”) about politics with other elders, and that passion about Cambodian politics and history always resonated with me. And I vividly remember how my grandfather would take out his short wave radio and tune into Radio Free Asia every morning at around 5:30 or 6am, and how I would wake up to the sound of the broadcasts, telling me about the current events in Cambodia and the political landscape there. I didn’t always fully understand what was happening around me, but my grandparents opened up a whole world of advocacy and politics and education that led me to the work I do now. College was when everything really came full circle. It was the time when I began thinking about my identity and when I became extremely proud of being Cambodian American. Since I had grown up in a rural town and had always been the “Other,” and because of the early exposure to my Cambodian roots that my grandparents provided me, I had never identified as Asian, just Cambodian. So when I went to college at Oregon State in Corvallis, a very different and much bigger place than Newport, I began trying to find other Cambodian students. I went to talk to my academic advisor, Dr. Janet Nishihara, the Director of Educational Opportunities Program, a program that supports first generation college students, and those conversations really changed me. It helped me to understand who I was, to become proud of my Cambodian American heritage. She told me that it had been ten years since the last group of Cambodian American students came together to form a CSA (Cambodian Student Association), a club that she had been the advisor of. She then offered to be its advisor again if I could find a few more students to join me. I took that as a challenge and a chance to connect with other students, and literally went around campus asking, “Hey, are you Khmer?” CSA opened up my world to the Cambodian community and showed me the different ways I could make an impact. For example, we worked with the Cambodian American Community of Oregon (CACO) and OSU’s Ethnic Studies and Anthropology departments to bring Khmer American rapper praCh Ly from Long Beach to perform on campus, and during Holocaust Memorial Week at OSU, we were able to connect with CACO to present their then recent Oral History projects documenting the Cambodian genocide. My work with CSA and its commitment to helping others, as well as the pride that I felt being Cambodian American, ultimately motivated me to run for student government at OSU and get involved in student politics. I wanted to be a part of the policy making process and to make sure that others could have a safe space to share their identity and to have pride in who they are, to have access to the resources they needed, and to feel included in the collective community. Above: NW Khmer Student Conference several years ago. I was invited to speak on getting involved with the local community. Your resume just scratches the surface of the incredible work you have done advocating for others, be it for students of color, Asian Americans, or specifically Cambodian Americans. 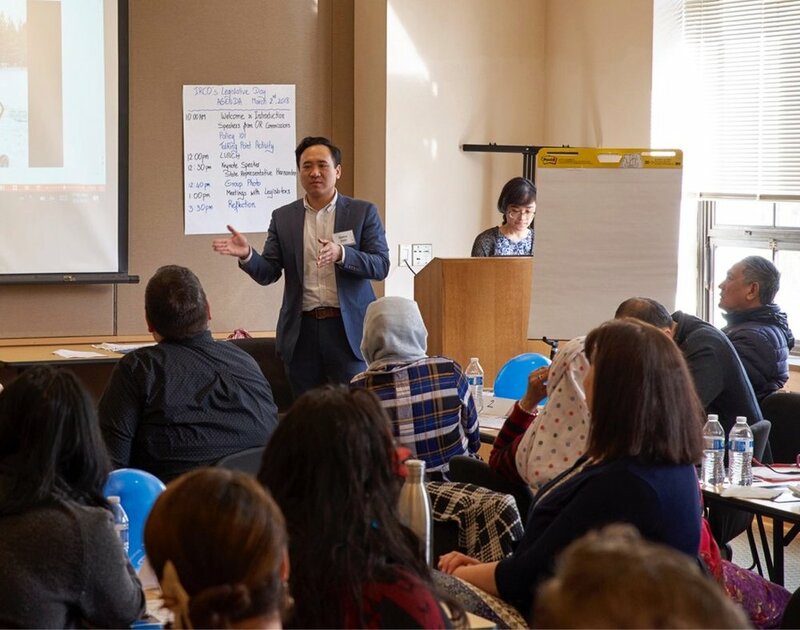 You are currently the Community Development and Special Projects Coordinator for the Immigrant and Refugee Community Organization (IRCO) and the President of the Cambodian American Community of Oregon (CACO). Can you tell us a little bit about how you got involved with these two organizations, and the significance they have in your work as a community organizer and a Cambodian American? I was a part of the first cohort of Asian Pacific Islanders Community Leadership Institute (APICLI), a collective group of other ethnic minority communities in Oregon, and that led me to the Immigrant and Refugee Community Organization (IRCO) and local community advocacy. I got involved with IRCO because it encompassed the three areas I was passionate about: getting involved with my community as an advocate and being in community spaces, the intersection of advocacy and community organizing and politics, and learning more about my heritage and understanding where we came from and who we are, especially within the wider collective community of other refugees and immigrants. IRCO was actually started by Southeast Asian refugees, and it is incredible to see how its scope has expanded to include other immigrants and refugees all over the world, and how much they have been able to accomplish in its 40+ years of operation. Above: (with left, Stefan Saing, IRCO Civic Engagement Coordinator) Advocacy at the Oregon State Legislature during the 2018 Legislative Session. Above: IRCO Legislative Day 2018. With Cambodian American Community of Oregon (CACO), I wanted to be a part of an organization that could make an impact on Cambodian Americans. For a long time I had been volunteering with and keeping in contact with the folks at CACO, and around three years ago, they recruited me when they had an opening for President. The organization’s level of community engagement and respect for the community, as well as the developing and maintaining of that respect, were responsibilities I usually associated with elders; I wasn’t sure if I was ready yet. Then I realized that this was an opportunity for me as the first president from this second generation of Cambodian Americans to take over and to bring along others. Even though I had always been so interested in my Cambodian heritage, I didn’t always know whether others felt the same way or were thinking about what we want the SEA community to look like down the road. For example, what is going to happen to these church and temple spaces? What is going to happen when our elders pass on and we don’t have that particular bridge back to our roots anymore? These questions motivated me to put together this working theory about the Cambodian American community: We come from these communities that are ingrained with a village mentality. In traditional times, a traditional Cambodian village had many layers of influence, whether it was the royal officials, monks, the elders, the fishermen, or the farmers — everyone had a place in the village. But this whole system was disrupted when we fled in diaspora. Without this system, a lot of us have lost our way and are struggling to find out who we are and our place again, but our village needs to be rebuilt to reflect what we need today. Right now our community is either very spread out and isolated or clustered together but in small pockets, but we’re not imparting our past knowledge to the younger generations, including my own. Many of the youth have no idea what the elders are talking about at temple or literally do not understand because of our lack of command of Khmer. So these are the things I was thinking about when I was approached by CACO, and my philosophy is built around not only what events and programming we can do in the present, but also to consider the long term projections about where we want the Cambodian community to be in ten or twenty years from now. Above: CACO received the 2017 Exemplary Community Volunteer Effort by the Oregon-base newspaper, Asian Reporter. Mental health is a major issue affecting almost every community, especially communities of color. In your line of work with IRCO and CACO, what have you noticed in terms of the relationship between mental health and the Cambodian American community? I recognize that mental health is a such big issue in the Cambodian American community and across most Southeast Asian American communities. PTSD is generational, and this trauma goes back to the loss of our village. For me, it’s important to think about what are we doing on the ground to engage our elders and different generations of Cambodian Americans to open up and connect and to create and strengthen our bonds, be it through Khmer schools, community gatherings, working with local governments to recognize the refugee experience and to provide better support, viewing immigration and family reunification through a humane lens, or advocating for more mental health awareness and services. I really sincerely believe that we still face the repercussions of the Killing Fields, when there were these destructive policies in place to cut the strings of family bonds, religion, and class, and completely annihilate the functions of what held a society today, and that this is the overarching trauma we face. In the meantime, it’s hard to start planning and making sure we have more intentional mental health services, but it’s something I think the local advocacy groups in Oregon like the Coalition of Communities of Color, service providers like IRCO, community-based organizations like CACO, foundations like Northwest Health Foundation, and local governments have been working on collectively over many years and should continue to work on together into the future. It’s reflected in the need to create better policies that truly mirror the diversity of the local community, that address culturally competent care, and disaggregates data to count our communities. Our community and many others across Oregon are engaged in these conversations whether directly or indirectly. And at each level of civic engagement and organizing, we must remember to bring our experiences to policymaking spaces and share in coalition a collaborative spirit that advocates for racial equity, dismantles systemic oppression, and disrupts institutional racism, impacts of colonialism, and patriarchy. In a tangible way, this means getting out the vote, actively engaging policymakers, and organizing spaces of informed discussion to focus in on social determinants of health that create barriers socially, economically, and politically in changing health services, social services, education, and economic empowerment. All of these are inextricably tied to mental health. In particular, mental health is a significant issue to CACO. We are committed to consistently engaging the community through our programs like the Khmer Language School, our community outreach, and through our work with other Khmer-based community spaces with Venerable monks and elders, like our local Watt Dhammanrangsi, and our wide reaching community events like our CACO Camping where we partner with the local Oregon Boy Scouts in Camp Meriwether. Camping, which is going on to its 21st year (in 2017, we had nearly 400 people turn out to camp) is one of those local Oregon/SW Washington Cambodian community traditions that I think helps to bridge generation gaps, and it’s an opportunity for us to become almost a literal village. On top of all your community organizing work, you are also pursuing a law degree from Lewis & Clark Law School. What inspires you to become a lawyer, and how will this degree help you be even more effective in the work that you do? My pathway to becoming a lawyer hasn’t always been so straight, especially when I tried to major in so many things when starting college; I ultimately fell into political science because I just loved it so much. One thing that really stuck out to me is that in the act of pursuing a law degree and becoming a lawyer, I am able to bring together all these different areas in my life and truly become an advocate. I draw so much from my Khmer heritage as a Cambodian American. I don’t consider myself a Buddhist but rather a student of Buddhism, and I am really drawn to Buddhist practices like Right Thought, Right Effort, and Right Concentration: Right Thought and understanding how the world works are very important in being an advocate, Right Effort is crucial in being an organizer, and Right Concentration enables the meticulousness needed to understand the law. The law felt like a natural direction for me because I wanted to stay in the public interest sphere and help my community. Did you ever personally learn about Cambodian or Cambodian American history, Asian American Studies, or Ethnic Studies in your history classes? And if you were to teach a course on Cambodian American history, what are a few books you would recommend? IRCO does a lot of popular education, and it is something that I admire and try to implement in everything I do. But at no point in my primary education did I have Ethnic Studies or learn about Cambodia or Cambodian American history. I think the closest thing might have been when we learned about the Vietnam War from the American perspective in U.S. History class. It wasn’t until college when I finally had a formal Ethnic Studies education, but I did have lived experiences that all together formed a strong foundation for Ethnic Studies: listening to Radio Free Asia five days a week, going to temple, and just being in spaces that allowed me to be immersed in Cambodian culture, history, and politics. I remember how in college, dovetailing with being a part of the CSA, I tried to find those formal places of study for Ethnic Studies - I took the Ethnic Studies survey class, studied Buddhist history and philosophy with the late Professor Blumenthal in the Philosophy Department, and even joined the monkhood for a week (there are 3 paths for a Cambodian person to enter the monkhood: a funeral, to honor your parents, and because you want to be a student and get an education). That experience was another moment when I felt really proud to be Cambodian, and allowed me to understand the intersectionality of Ethnic Studies, religion, spirituality, and community. Above: In 2011, I became a Samenera (novice) for a week to learn about Buddhism. We Didn't Start the Fire: My Struggle for Democracy in Cambodia by Sam Rainsy: an autobiography that talks a lot about the 1950s and 1960s era, Rainsy’s continued fight in politics in Cambodia, and what his perspective on Cambodian politics was up to the past decade. All these books are heavy on Cambodian history, but they helped create a broader framework for me as a Cambodian American to have a stronger understanding of the collective trauma developed through generations of our community. You really have to fight and find your way to learn about Cambodian and Cambodian American history, and find resources that are balanced — most Khmer folks learn about their history and who they are from one or two sources, be it their elders or parents or relatives, but sometimes it is helpful to have a more objective lens. So whether you want to be in Cambodian American spaces, in organizing, or in advocacy, it is much better if you have a better understanding of the structures at play globally. Who are two other individuals or organizations doing amazing advocacy work for the Cambodian American or Southeast Asian American community in your local area? Sophorn is a mentor to me, an older sister, and overall badass. She is Cambodian American, she is a passionate advocate and community organizer, and just got appointed as Diversity, Equity, and Inclusion Director for the Governor's Office. It’s so amazing to have a Cambodian American and someone who is from these community spaces in our civic spaces and public offices. It is so important today in this political time to have politicians and advisors to these politicians reflect our communities. Chanpone is another amazing individual. She is a Lao American attorney who used to work at IRCO while she was in law school, and she has been a guiding star for me. Like Sophorn just a total badass. She works as an immigration attorney and it’s been so inspirational to see the work she has done to help so many different communities. Her impact on my life specifically is also significant. She helped organize and spearhead the Refugee Adjustment Day which brings together attorneys, law students, community groups to assist refugees in their paths to self-sufficiency and to become part of the American fabric. This event actually really influenced my decision to become a lawyer.